It is no secret the country is bitterly divided now that Donald Trump is the presumptive Republican nominee and likely will face Hillary Clinton in the November general election. 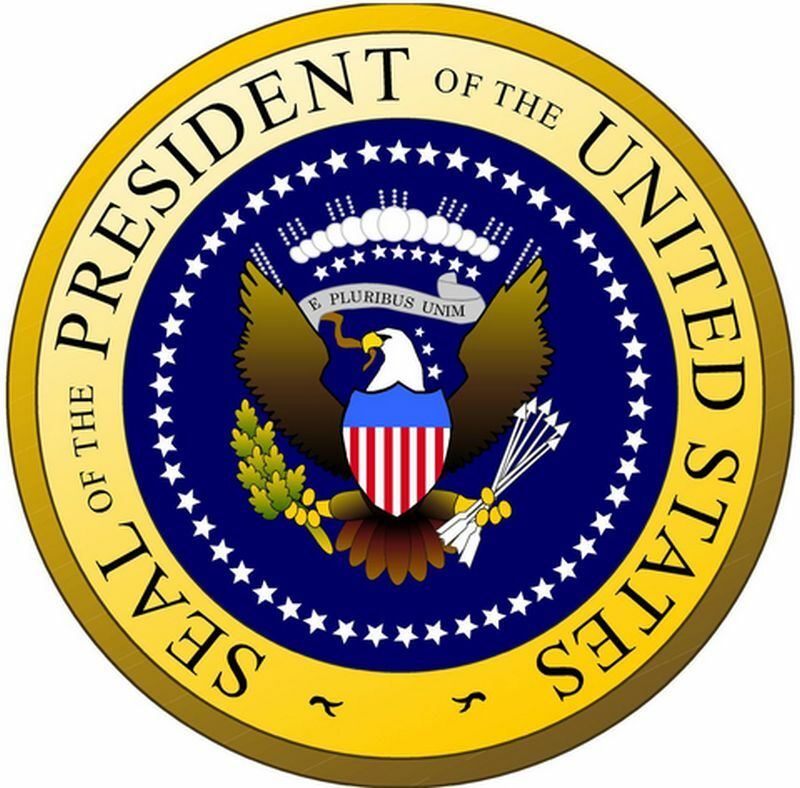 To say neither is qualified to occupy the Oval Office is a gross understatement, regardless of what either of their starry eyed devotees my claim. Both are well known New York Liberals that care only about themselves and both would devastate our country if not plunge us into a bloody war. But we have to have a president and we need a candidate worthy of our votes. And, given the choices the parties present us, I believe I have found the perfect man for the job. He is well known and highly popular with people from both parties. He has been seen frequently on television singing opera, directing orchestras and is an avid hunter, telling me he would defend our second amendment rights with his every being. He’s not afraid of getting his hands dirty, having actually prospected for gold at one time. He’s never been caught up in any sexual scandal or seen cavorting with women of questionable reputation. He’s been a strong supporter of our Military throughout our wars doing what he could to sell war bonds. Granted he has a slight speech impediment, but it does not stop anyone from clearly understanding him or how words and you have never heard foul language coming from his mouth either. His bipartisan appeal is likely his strongest suit as his efforts over the years have pleased many, brought smiles to their faces and eased their souls during troubled times. He’s never amassed a fortune, although others have amassed wealth due to his hard work for so many years. In fact, given the poor choices we see before us this election, I can’t think of a better man for the job. Let’s put our efforts behind a true American that will really make America what it could be. 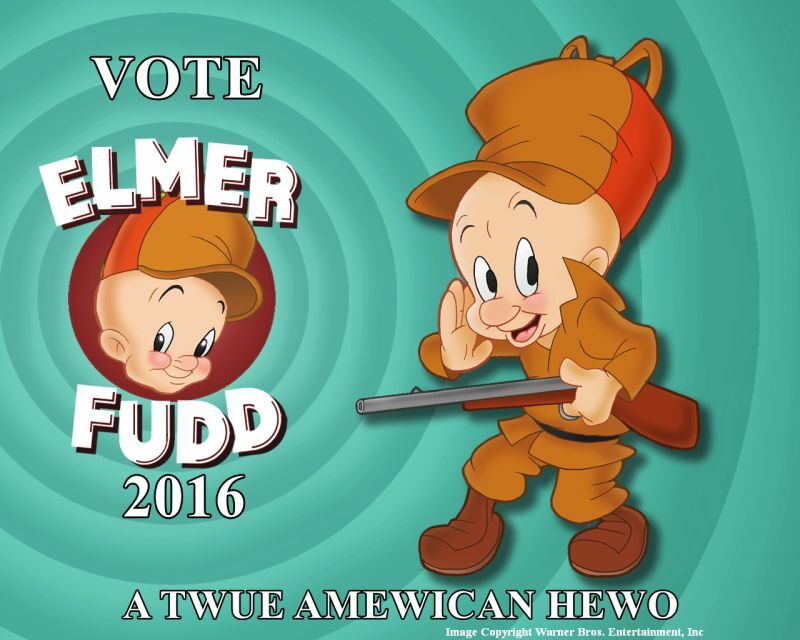 I’m proudly casting my vote for Elmer Fudd this year. He stands heads above either Hillary Clinton or Donald Trump. Help keep this blog active with a voluntary contribution at the PayPal button at the top of the sidebar on the right. Thank you. We don’t need another cartoon character like Trump. Besides, Elmer never hit anything he aimed at. Since Elmer Fudd is obviously a supporter of the Second Amendment, it is likely that he would be an attractive candidate. At the current point, there are a lot of histrionics about Donald Trump vs. Hillary Clinton. Please let me assure you that nether one of these candidates are acceptable to me. But one has to consider the choices of voting in light of this reality. The choices are 1. Hold you nose and vote for Trump. 2. Hold your nose and vote for Clinton. 3. Vote for someone that you might prefer (among 3rd party candidates) with the understanding that they’d have virtually no chance of winning. Or 4. not voting at all. We can assume that Clinton will be a continuation of Barack Obama. She will continue to over-regulate and over-tax our economy, continuing the dreadful economic conditions we’ve had for the past 8 years. We can also assume that Hillary will nominate abominable candidates for the Supreme Court (and for all the many dozen lesser court judgeships that become vacant each Presidential term). These Supreme Court nominees will hold sway over the court for at least a generation, shredding the Constitution (through the “living constitution” philosophy) and destroying our rights along the way. Clinton will also continue the corruption of selling favors as was started under Bill and as continued through Hillary’s term as Secretary of State. Clinton will continue to hide and cover-up her activities, as was done with Whitewater, Benghazi, her private email server, etc. Finally, if Trump really screws up, he can be impeached. Obama had — and Hillary would have — the complete support of the unified Democrats in Congress. Even if an impeachment act could be passed by the house, the Democrats in the Senate would surely not vote to impeach Clinton (just as they would not do so for Barack Obama). Trump does not have the complete and total allegiance of the Republicans in Congress … and thus, there would be little to stop an impeachment from proceeding. The Democrats, aside from whatever mischief they might make, are also unlikely to “support” Trump under such circumstances. So, the number one important thing is to attempt to retain as many Republicans in the House and Senate — and elect “new” Republicans to the extent possible (much easier if Trump is likely to win in November — much less likely if Hillary is elected). While I might wish that this mess was a bad dream, the reality is that I’ll most likely have to hold my nose and vote for Trump. I’d rather have the devil I don’t know, because the devil I do know is one that is particularly bad and will simply make the whole political situation much worse than it already is. My hope is a contested convention and someone more acceptable to the broader base be nominated. If that doesn’t happen, I cannot in any sense of good conscience for for either. I must stand on principle and act accordingly on this. There is no holding of the nose for any lesser of two evils. We need to remember that the President is not a dictator, or is not supposed to be anyway. They can all talk of their grandiose plans, but much of it requires congressional approval. Congress needs to reassert itself. Who has their finger on the button may be the biggest concern. We tend to forget that now-a-days. I’ll be voting for Cruz in the primary. I’ll likely vote for Trump after that, but whoever the Libertarian candidate is will be worth a look. Trump is hated by Europeans and American leftists, and that’s a big plus for me. Yes, it really is. Actually ‘Friend’ makes a good case. Clinton will have lots of help continuing the Obamaian policy of shredding the Constitution and destroying what’s left of the United States, and we would not be able to get rid of her even if the FBI pursues a case against her for the file server issue (which of course would be dropped as soon as she’s elected). Trump friends in Congress: few to none. You can forget the numchucks in Congress who are frantically trying to catch the ‘Trump Train’ – as soon as he gets in trouble they will disappear faster than dry leaves in a wind storm. As far as Andrew Johnson, yes he remained in office, but by only 1 vote. Trump will have even less friends in Congress than Johnson. It’s a good leash and will fit Trump perfectly. I absolutely will not vote for Clinton under any circumstance. I vacillate on Trump almost daily (i.e. he’s not Clinton) so it’s possible I would end up voting for him. Another thing to consider is that was friendly as the media would be towards Clinton, they would pursue a case against Trump no matter how thin it was so he would be constantly off-guard. It’s a pretty pathetic way to run a country but what do you do? With such lousy choices, I’m inclined to sit it out this time. Either of the two is detrimental to our nation, but my conscience will be clear that I stood on principle and my name nowhere supports either. There is no lesser of two evils this time. Just two evils, almost as if it were planned this way. Time will tell. If Trump starts getting closer in the polls to Clinton, but then acts out even more outrageously than he already has, you will know for sure that the fix is in. Whether or not the fix is actually in, as I believe, he would be as detrimental to the country at the top as would Hillary. Both are self absorbed narcissists that care about nothing but themselves.